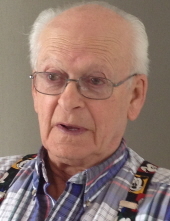 On April 12, 2019 Jim Letawsky of Fort Saskatchewan, Alberta passed away peacefully, surrounded by family, at the age of 89 years. Jim is loved and remembered by his four sons, Brian (Marlene) Letawsky, Colin (Caroline) Letawsky, both of Vermilion, Lynn (Sheila) Letawsky, Jim Jr (Carla) Letawsky, both of Fort Saskatchewan. Step Daughter Heather (Dave) Pyrch of Nanaimo, BC, numerous grandchildren, step grandchildren, great grandchildren, step great grandchildren. Brothers William (Joanne) Letawsky, Steve (Audrey) Letawsky, sisters Mary Stodola, and Audrey Alenic, step brothers Archie (Marian) Melnyk, Gary (Maureen) Melnyk. Sister in-law Hazel Letawsky. Jim was predeceased by his loving wife Anne, his parents Steven and Stella, brother Peter, step father Jim Melnyk, step brother Leonard Melnyk and his wife Connie, brother in-law Peter Stodola. Respecting Jim’s wishes, no funeral service will be held. Cremation has taken place, and a family graveside service will be held at a later date at Vermilion, Alberta. Donations in Jim’s memory may be made to the Alzheimer Society of Alberta. "Email Address" would like to share the life celebration of James Paul Letawsky. Click on the "link" to go to share a favorite memory or leave a condolence message for the family.